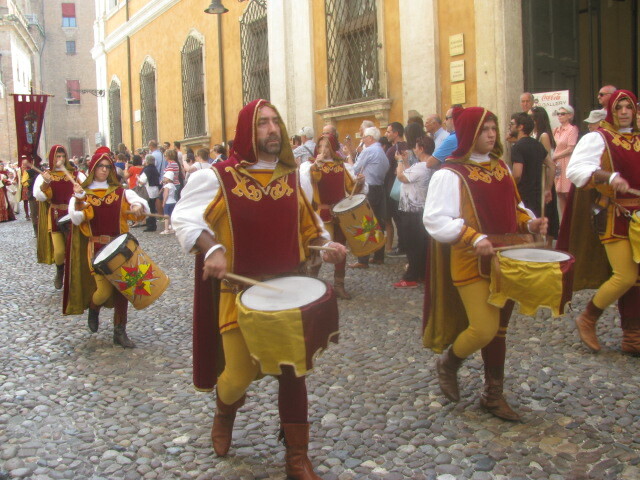 Ferrara, once political center of the noble Este family, where Lucrezia Borgia daughter of Pope Alexander VI lived and was wife, mother and beloved duchess, has several places where to learn more about Northern Italian history and Italian regional cuisine. The city was also once the culinary test kitchen of Messisbugo, one of the most prominent food writers, chefs, nobility stewards of the early Renaissance (15th and 16th century). Little is known of this famous household administrator and “scalco” (Italian Renaissance term describing a chef) of Flemish possibly Tirolean background besides what he left behind in writing to demonstrate how Nothern Italian cuisine was the 16th century. After entering the service of Ferrara’s Este family at a very young age in 1515 (Bradford p. 338), Cristoforo Messibugo, also known as Messi Sbugo or Messi detto Sbugo, was first culinary and administration apprentice and later head household retainer to several members of the Este and Gonzaga family, especially to Cardinal Ippolito d’Este, brother to Ferrara’s Lord Alfonso d’Este, and to Isabella d’Este Gonzaga, wife of the Lord of Mantova. Elevated to the status of Count by Emperor Charles V in 1533, Cristoforo Messibugo dedicated his life in putting together a manual of elite banquets and recipes with the title: BANCHETTI COMPOSITIONI DI VIVANDE ET APPARECCHIO GENERALE DI CHRISTOFORO DI MESSISBUGO ALLO ILLUSTRISSIO ET REVERENDISSIMO SIGNOR DON HIPPOLITO DA ESTE CARDINALE DI FERRARA CON GRATIA ET PRIVILEGIO (IN FERRARA PER GIOVANNI de Buglhat Et Antonio Hutcher Compagni Nell’ Anno MDXLIX (1549). 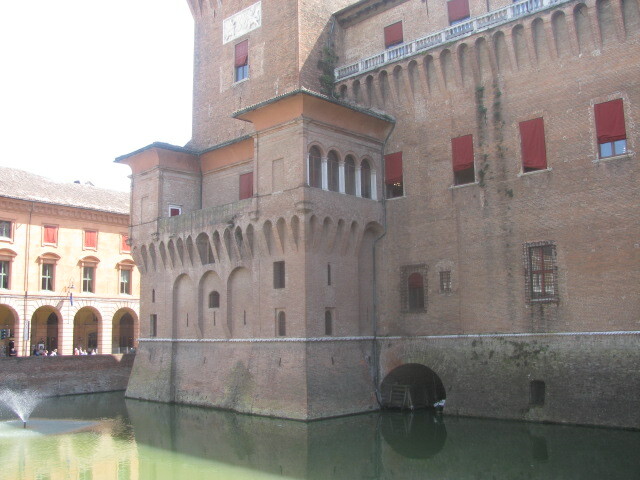 The treatise explained how to cater to important power brokers of the time and how to prepare regional and international specialties which could impress his employers the Dukes and Duchesses of Ferrara and their guests. His life master work, dedicated to the Duke’s brother, Cardinal Hippolito II, was first published in Ferrara in 1549 and later in 1557 in Venice. 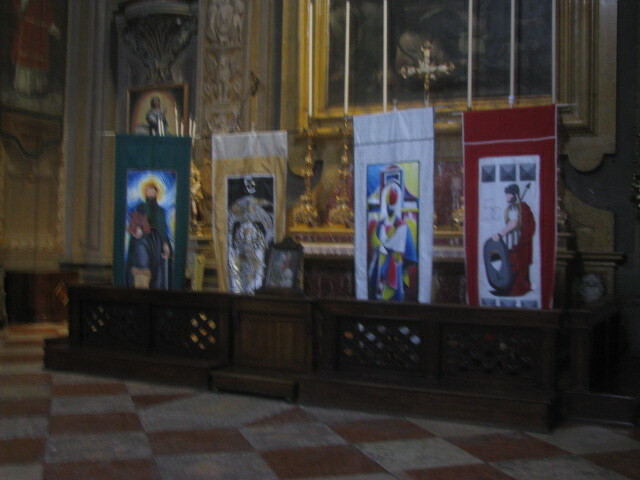 Messisbugo died in 1548 before his work was published and was buried in the Church of Sant’Antonio in Polesine (Faccioli 285-286). While the famous Ferrarese Household Retainer and Chef compiled his work American pumpkins had not yet reached Ferrara. Zucchini, also called zucchine or cocuzze used at the chef’s time were probably the long bottle shaped squashes of African origin. Later when American pumpkins arrived in the city of the Este family, the turban shaped ribbed American pumpkin substituted the bottle neck squash, and became the favorite filler for the famous ring shaped pasta pockets usually topped with meat ragout or dressed with melted butter and sage. Marked by the political and cultural history of the Este family with their at times tempestuous relationship with Popes, Kings, Emperors. 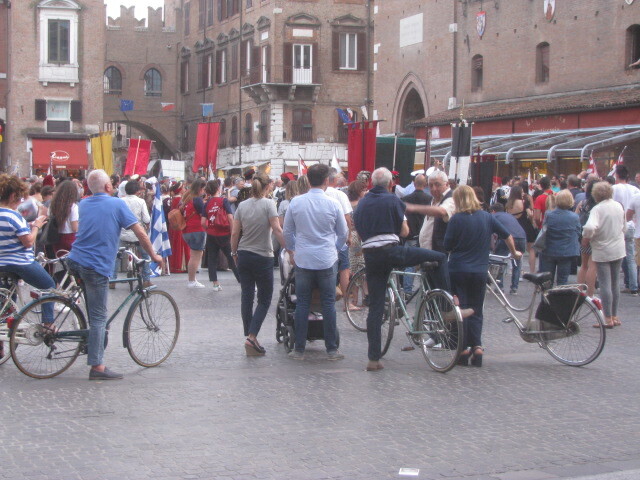 and the ancient Republic of Venice, influenced by Messimbugo’s culinary tradition, Ferrara today is the modern castle town where local and regional food specialties are famous. 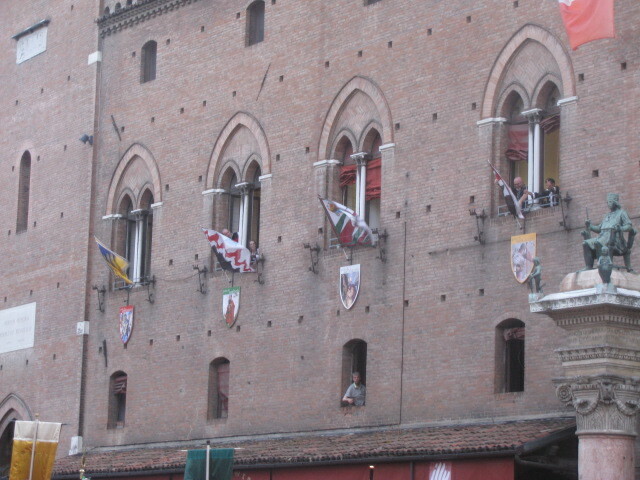 Prominent dishes include: Cappellacci di zucca (ringshaped pasta pockets filled with pumpkin); Pasticcio alla Ferrarese (a slightly sweet flaky pot pie filled with meat, mushrooms, truffles); Salama (a type of pork mow sausage filled with innards moistened with red wine) usually served with mashed potatoes, and the sweet dark Pan Papato (also called panpepato) a type of fruit cake offered usually with coffee or white Pomposa wine. Located in the Northern Italian of Emilia Romagna, Ferrara is 70 miles away from Venice and its islands; 63 miles away from Modena, famous for the Aceto Balsamico (balsamic vinegar); 91 miles away from Parma, worldwide known for Parmesan cheese and prosciutto di Parma; 68 miles away from Verona, home town of Romeo and Juliet; 49 and 34 miles away from Padova and Bologna, cities famous for old universities in Europe. The history of this specialty is almost as old as Ferrara itself; the recipe a secret. 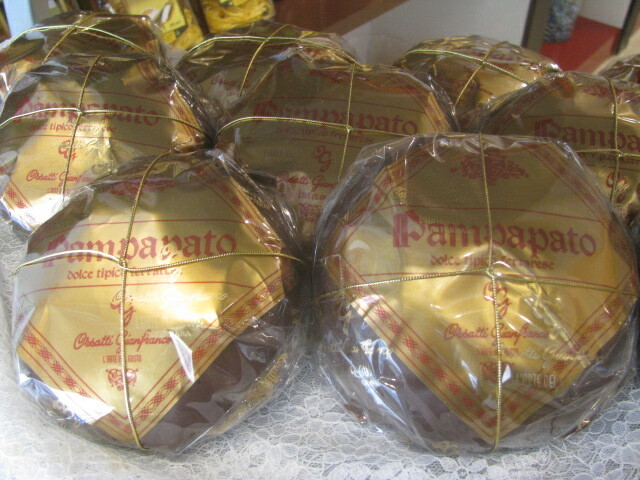 According to local tradition, Panpapato was created by an Abbess in a nearby convent who wished to prepare a sweet specialty for the Pope’s visit. Old ways to prepare it included instructions on how to make a dough with flour, grape syrup, raisins, candied orange and citron peels, almonds, hazelnuts, pine nuts, honey, possibly local liqueurs and spices such as cinnamon, nutmeg, and black pepper. In time, after local patisserie know how was influenced by newer exotic ingredients such as chocolate also cacao powder and coffee were added to the round dark specialty. Hear say describe also the local wedding of Marquis Tebaldo (around 1012) as one occasion during which piles of panpapato were distributed to attending guests and people of the community. This dates back to when Count-Marquis Tedaldo of Canossa had been the ruler of Brescia, Modena, Ferrara and Reggio, before the Este became rulers of Ferrara in 13th century with Obizzo d’Este (1264-1293). 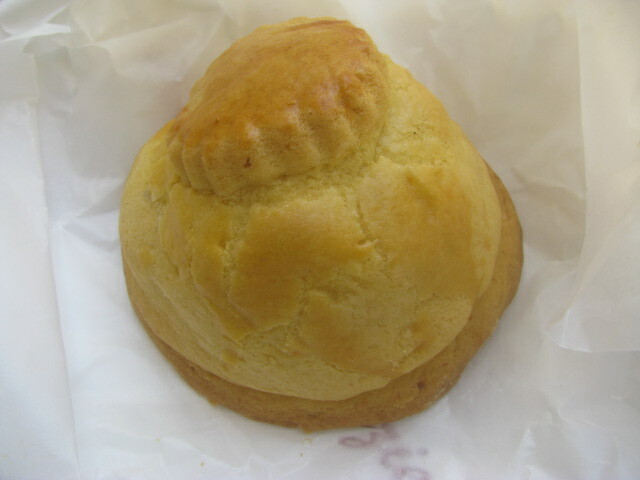 500 gr flour, 300 gr. softened butter, 2 whole egg + 2 yolk, 200 gr sugar (granuated), freshly grated lemon rind and a pinch of salt. 250 gr cooked ribbed “sedanini” pasta; enough ragout prepared with 150 gr of chopped meat of pork, 150 gr ground meat of veal, 100 gr of fresh sausage, 30 gr butter, 1/2 glass of white wine, 2 Tbsp. of Marsala wine, 1 Tbsp of olive oil, chopped carrots, chopped ribs of celery, and chopped onion; enough white sauce prepared with 1/2 liter milk, 60 gr of flour, 30 gr of butter, a pinch of sat and ground nutmeg to taste; 100 gr grated Parmesan cheese, 30 gr porcini mushrooms soaked and truffle shavings. Prepare the dough for the flaky pot pie; refrigerate at least 2 hours, roll out 2 circles (one 28 cm in diameter and one 32 cm in diameter. Cook the noodles in salted water and simmer the soaked drained porcini mushrooms. Pan fry the vegetables in oil and butter, brown the meat, season with salt and moisten with wine and Marsala. Pour the cooked “sedanini” pasta, dressed with ragout, white sauce, and truffle shavings in the baking dish lined with one of the dough wheels. Make sure to seal the pasticcio by pinching together the disks of dough. Cover the whole with the second rolled out dough. With left over dough, roll out and cut out leaves or flowers to decorate the top of the pasticcio. Brush the top with with egg yolk and bake at medium heat (about 170 degrees Celsius) for about 25-30 minutes or until the top has a golden brown crust. Cut in sections and serve still warm (By courtesy of Orsat Grou, Ferrara). Ferrara’s Salama is a round pork mow type of sausage prepared with pork meat, moistened with dry red wine, sprayed with cognac and flavored with lots of spices. It is aged for at least a year often under cinders or ashes. To cook this specialty inhabitants of the city wrap it in a white linen and drop it in cold water and simmer it for about 4 hours. Some old fashioned Ferraresi hang the sausage over a pot of boiling water and cook it (practically steam it) for at least 7 or 8 hours. It is very very unique in its flavor; let’s say, it might be an acquired taste for those who come from outside town. 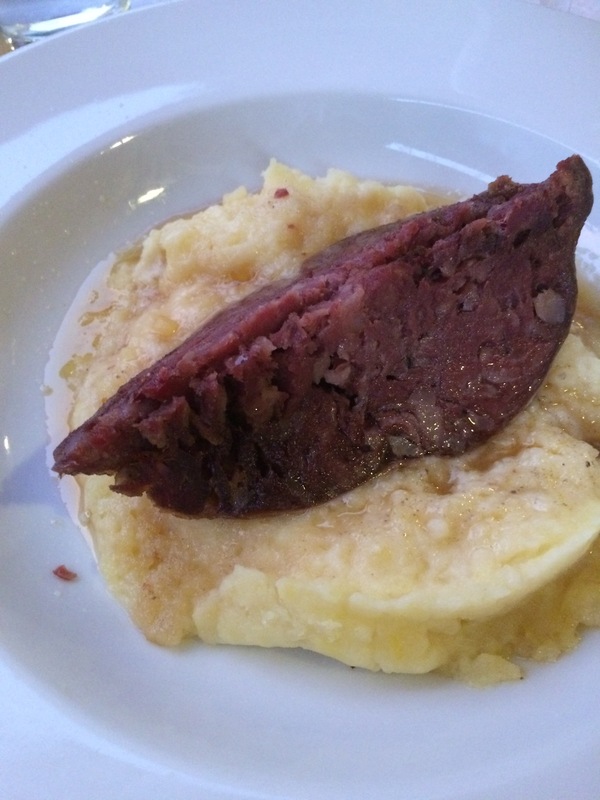 Usually salama is served with mashed potatoes or and boiled greens (Lisa Biondi p. 89) and a glass of red Lambrusco di Salamino. AL BRINDISI FORMER HOSTARIA DEL CHIUCHIOLINO: among the oldest osteria’s in Ferrara if not the oldest in Italy; dating back to 1435 was a favorite hostaria for famous Italians, such as Benvenuto Cellini, Tiziano Vecellio, Ludovico Ariosto, Torquato Tasso and known also to Nikolaus Copernicus who studied in Ferrara. 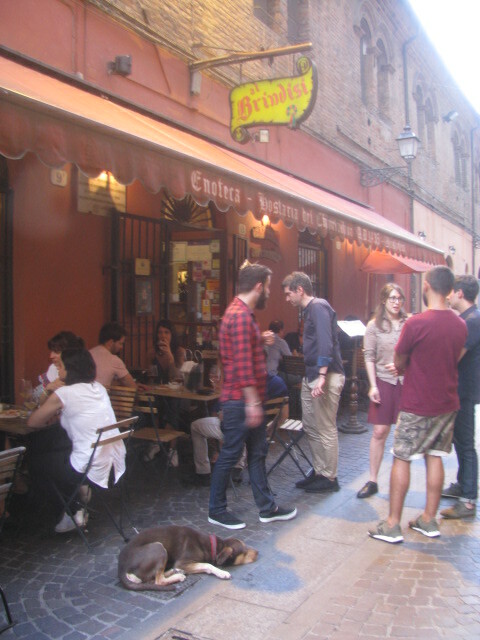 Via degli Adelardi 11, 44100 Ferrara – Tel 0532 473744 or contact at http://www.albrindisi.net; Closed on Monday and open every day from 11 AM to Midnight. 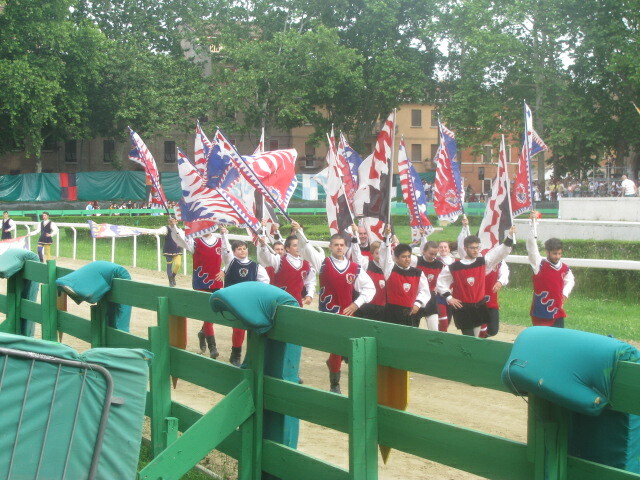 Ferrara is the site of a very ancient yearly PALIO race which dates back to 1279 to Nicolo’ and Borso d’ Este when the various neighborhoods competed in four speed races which honored St. George, the Patron of the township. 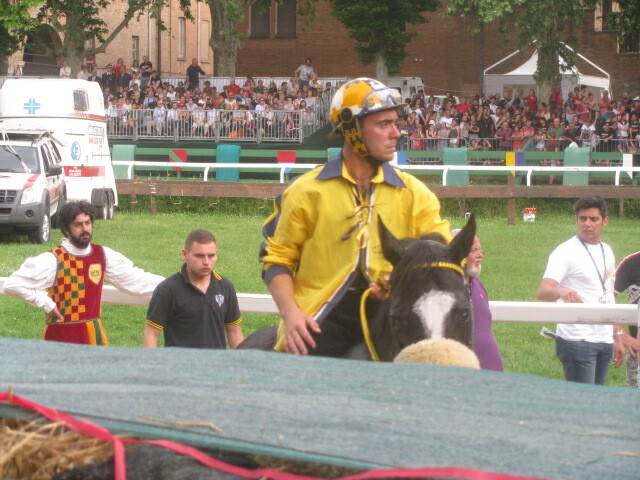 Usually the PALIO of Ferrara took place during the month of April, however, more recently it postponed to May taking place in Piazza Ariostea. 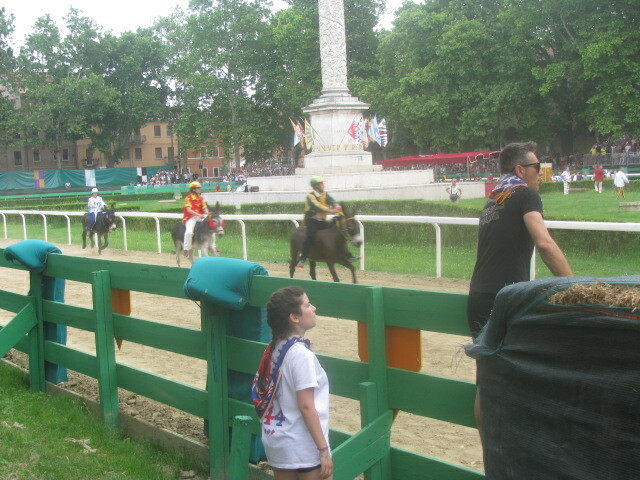 This year’s PALIO had 8 neighborhoods competing; first with a speed race run by young guys (pupi), second a speed race run by girls (pupe), third a speed race ridden on donkeys (somari) and finally a speed race on horses. Thus eight neighborhoods competing for four banners blessed in church and later awarded by local authorities to the winners to celebrate the city with its 140,000 citizens and the ancient Este legacy. ← IN ROVERETO (TRENTINO) – ACCORDING TO ACCADEMIA ITALIANA DELLA CUCINA OR ELSE?